Company Car & Van were lucky enough to drive the latest version of KIA’s best seller the Sportage in Barcelona back in 2016. Kia are not a brand who sit on their laurels & in mid-2018, they updated the Sportage adding an improved infotainment system & a revised engine line-up, including the introduction of a mild-hybrid setup in the 2.0-litre diesel. The two petrol models have been tweaked as well, to allow them to pass the latest & more stringent emissions tests & the diesel lineup is all new. A 1.6-litre diesel is available in two power outputs & this takes the place of the old 1.7CRDi, whilst the new range-topping 2.0-litre diesel makes use of mild hybrid power & this was the model we got to drive recently. Like the rest of the Kia line-up, the Sportage comes in trim variants that are easy to understand. 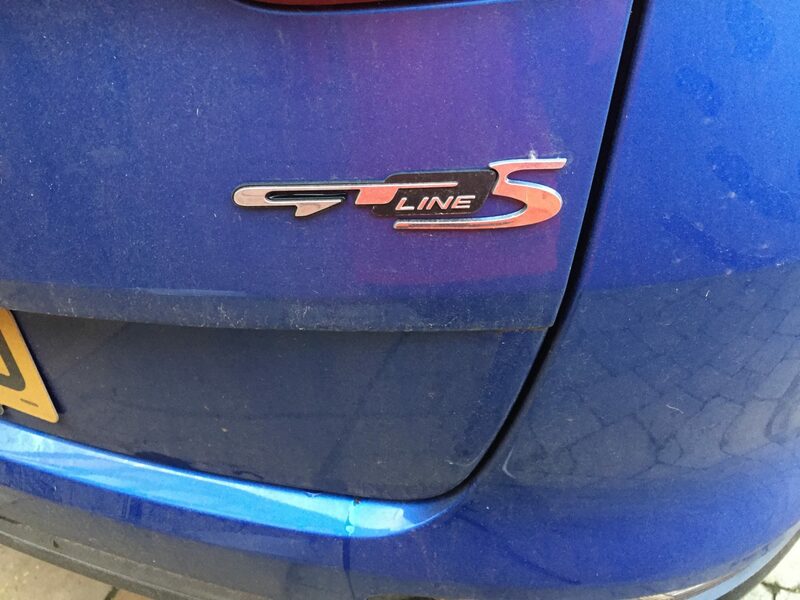 There’s 1, 2, 4, GT Line & the top spec GT Line S, the spec of the model we tested. The first thing you notice about the new Sportage is it’s looks. The last model turned heads but this one is definitely prettier if perhaps a little less rugged looking. Gone is the elongated rear end & prominent hatchback to be replaced with an altogether softer looking & to my mind more attractive rear end. With a new ‘Tiger’ front grille, higher more prominent headlights & sharper defined LED front fog lights the new Sportage is a altogether a smoother, softer looking proposition than it’s predecessor & is certainly not as angular as stablemate the Hyundai Tucson. Looking at it from the side & from the rear it does bear some resemblance to the Qashqai, but the new KIA front grille & lights make make the Sportage a far prettier car than the Nissan. The 2018 update introduced some chrome whiskers on the front bumper & the rear end gained a full-width light bar. Inside, the changes include a new steering wheel, driver’s display & air con controls. Quality is excellent, with plenty of soft touch plastics on offer, especially in out GT Line S test car. The Koreans know how to attract customers & one sure way is to offer well equipped entry models. t. The entry-level Sportage ‘1’ comes with 16″ alloys, LED daytime running lights, air con, cruise control, a reversing camera & a 7″ touchscreen. The ‘2’ adds 17″ wheels, SatNav, heated front seats, lane keeping assist & a speed limit warning system. The ‘4’ has 19″ alloys, an 8″touchscreen, LED head & tail lights, electrically adjustable leather seats heated front and rear, a JBL sound system & a panoramic sunroof. GT-Line actually costs a little less than the 4, doesn’t have panoramic roof but adds a start/stop button, some red piping & stitching on the seats & black headlining. The top-spec GT-Line has the panoramic roof, power tailgate, wireless smartphone charger & a 360-degree surround view monitor. Both 7″ & 8″ touchscreen’s offer Apple CarPlay & Android auto. The 8″ version gets a sharper image & faster touch response. Kia’s infotainment interface comes with a split-screen home page showing mapping on the left & other options on the right. It’s clear, concise & it’s a very intuitive system to use. SME customers will want to now how frugal the new model is. Well the 2.0, 8-speed auto that I drove for a week, offers CO2 emissions of 152g/km with a combined fuel economy of 48.7 mpg. This model comes equipped to perform proper 4WD manoeuvres & to my mind, is not the model I would choose for motorway or urban living. And, retailing at £34,545 it’s an expensive route into a Sportage. The new 1.6 diesel is more frugal, offering (depending on spec) 49.6mpg & CO2’s of 150g/km & will tick plenty of user chooser boxes next time they come to change their company vehicle. 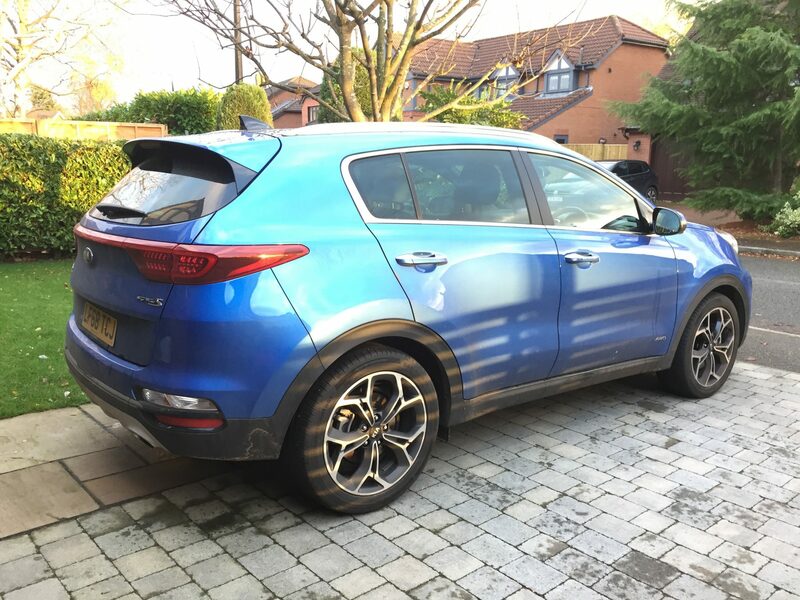 My week in the 2.0 model gave me an average economy of just under 37mpg, so not actually that bad, but I’m confident that the 1.6 is likely to achieve mid-forties mpg & is therefore a safer bet. As a practical proposition, Sportage is bigger than the pre 2016 model. It’s about the same height & width as it’s predecessor, but is 40mm longer increasing the wheelbase which gives all 5 passengers more leg room. The boot too is 15 litres larger than before with a minimum capacity of 491 litres & with rear seats folded, a maximum of 1492 litres. There’s a split fold rear seat combo & the three rear seats can be adjusted fore & aft by up to 30 degrees. The cabin is also quieter than before. 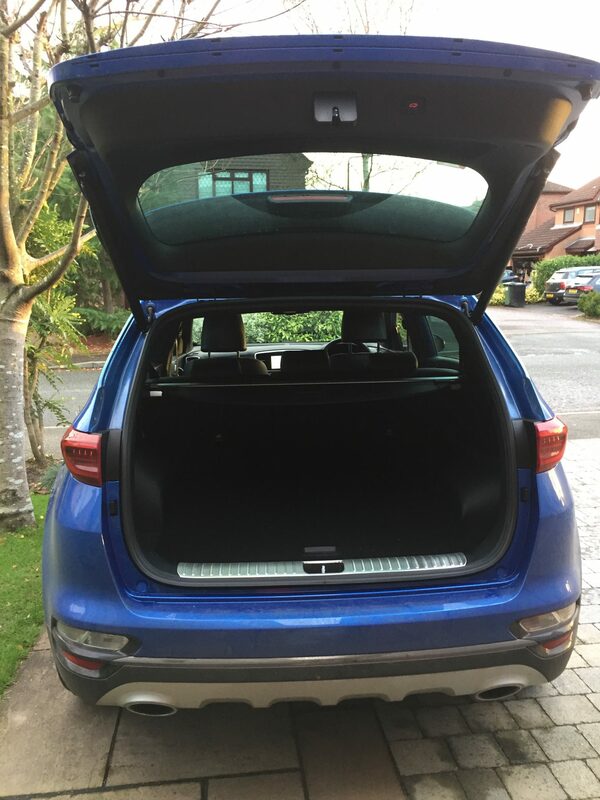 KIA have gone to great lengths to insulate the cabin from both road & wind noise, with more body insulation & have even added foil to the front windscreen to achieve this. How does it drive ? With it’s 8- speed auto gear box & well weighted steering, the Sportage performs well on the motorway & is also enjoyable to drive around town, even in stop/start traffic. On the motorway the upgraded insulation keeps the cabin quiet & the excellent JBL sound system allows driver & passengers to listen to their favourite tunes in relative peace & quiet. 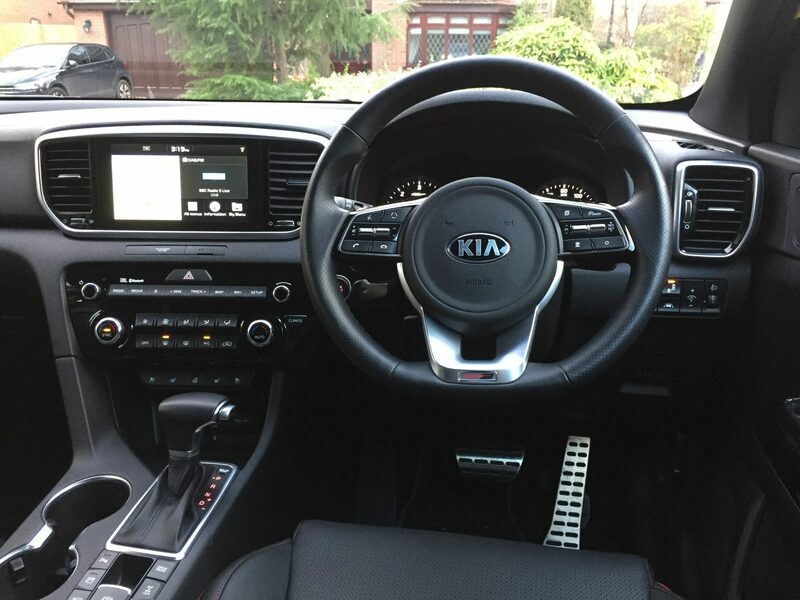 Apple CarPlay was a godsend as I travelled over 700 miles in my week in the KIA. Accessing messages, taking & making hands-free calls, are all highlights of this connectivity & the set-up on board the Sportage is second to none. Many SME drivers may already be driving a Sportage, possibly the 1.7 CRDi diesel version. The upgrades made to the range, specifically with the new 1.6 diesel engine & improvements with the on board technology, make the 2018 version better still. From our perspective, the Sportage was one of our top ten new cars for SME’s back in 2016 & the 2018 updates make it even better & it’s still one of the best in it’s sector. 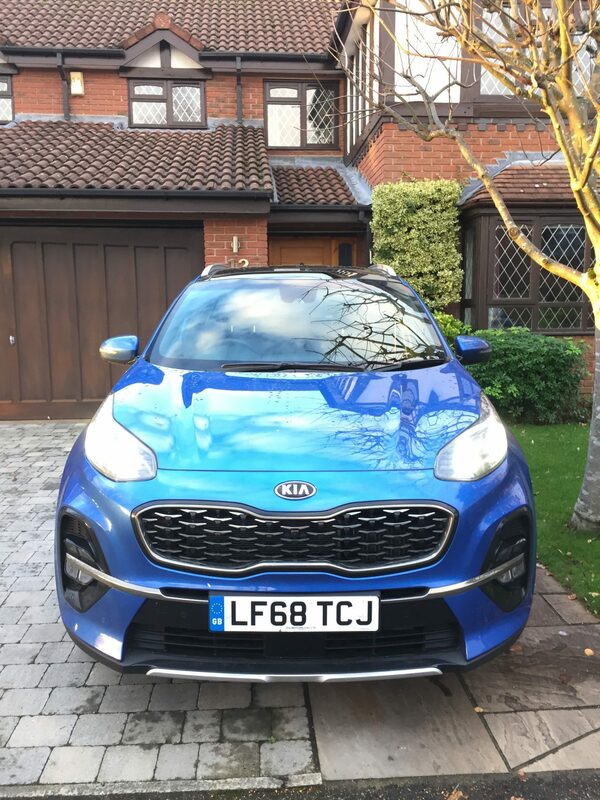 Although KIA are introducing an EV Niro in early 2019 & more electric KIA model’s will follow, I have no reason to doubt that the latest Sportage will still be KIA’s best selling UK model for the forseeable future. Even better than the last one 4/5.